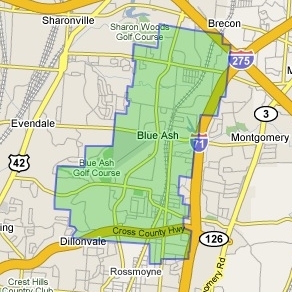 Blue Ash is home to Blue Ash Airport, one of only three regional airports in Greater Cincinnati. Owned by the City of Cincinnati, the airport is open to the public and operates an average of 96 flights per day. For more information, click here. The airport hosts an air show every year, and flying lessons and sightseeing flights are also available. Also of note in Blue Ash is Raymond Walters College, a branch of the University of Cincinnati offering Associate Degrees in a wide variety of areas of study. Its over 4000 students attend both full and part time, and the school offers night and weekend classes and distance learning for working students.